“What we use to call biophysics often is just physics of biological material or the dynamics of the material processes involved. …. I am asking for a ‘physics of biology’.” -Manfred Eigen 2000. What is a Phase of Matter? In school, we are taught about states of matter: solid, liquid and gas. Normally people graduate high school with the impression that those represent the only examples of states of matter- you may remember hearing something about a fourth phase called plasma, but that’s usually discarded as ‘something different.’ For almost all of human experience, all matter can typically fall into one of these three phases; solid, liquid or gas. It might seem reasonable to suggest these are the only states of matter possible and for a long time physics would have agreed. The study of phases of matter is a strange narrative. No one can be credited with discovering the existence of phases, as even the most ancient thinkers were aware of the differences between liquids and solids. It was not until 1911 that a new phase of matter was discovered. Heike Hamerlingh Onnes discovered superconductivity in mercury while working at the University of Leiden. His experimental results were so surprising that they wouldn’t be explained theoretically until 1965 by the BCS theory. With Onnes discovery the flood gates were open, over the next few decades dozens of new phases of matter would be discovered. Some famous examples include Bose-Einstein condensates, and superfluids. Why don’t we usually hear about these other forms of matter? Well even the physicists and chemist who study these strange configurations of matter describe them as “exotic.” They are not the kind of thing you would come across in your day to day life, new states of matter are often cooked up in labs and will never have practical applications. So what is a phase of matter? If there were only three different types it might not be such a difficult question. We could simply enumerate all of the possible states of matter, describe the differences between the different phases and be done with it. However, as more and more distinct states of matter are being discovered it’s not clear that we should expect the list of all possible states of matter to be finite, and further, there is no reason to expect that all states of matter are mutually exclusive. For example, carbon nanotubes can be simultaneously solid and superconducting. This fact doesn’t fit into the high school narrative we were taught, so it might seem surprising. You never come across something that is both solid and liquid or liquid and gas in your day to day life. But those two descriptions (of carbon nanotubes) are referring to fundamentally different properties of carbon nanotubes, the solidity describes the fact that carbon nanotubes will not change shape to fit into their container, while the superconductivity refers to the nanotubes electrical resistivity (or lack thereof). Phases of matter are distinguished by their emergent properties; Emergent properties are qualities which come about not as a result of fundamental characteristics of individual components, but rather as a manifestation of the interactions between many components. For example, a single molecule of H2O is not water, ice, or vapor; it’s just two hydrogen molecules and one oxygen molecule bound together. Single molecules have no properties that can be identified as their ‘phase’. However, take many molecules of H2O and new measurable characteristics emerge, that do not exist for individual molecules. These characteristics are the manifestation of interactions between the constituent parts of a given material system. They cannot be assigned to any particular atom, molecule or component, but they are still an undeniable property of the whole. For example, water at room temperature is liquid and a property of liquids is that they take the shape of any container they are in. This doesn’t mean that the individual water molecules have changed at all, it’s just that they are free to be rearranged in any arbitrary manner. To the physicist’s eye, physical phases are a way of carving up a large parameter space into regions wherein the bulk properties of the system are essentially uniform, or change in a uniform, continuous and predictable manner. As a result, most of the theoretical work on phases has not been dedicated to understanding particular emergent properties, but rather on phase transitions. Phase transitions are the dividing lines between distinct states of the system. 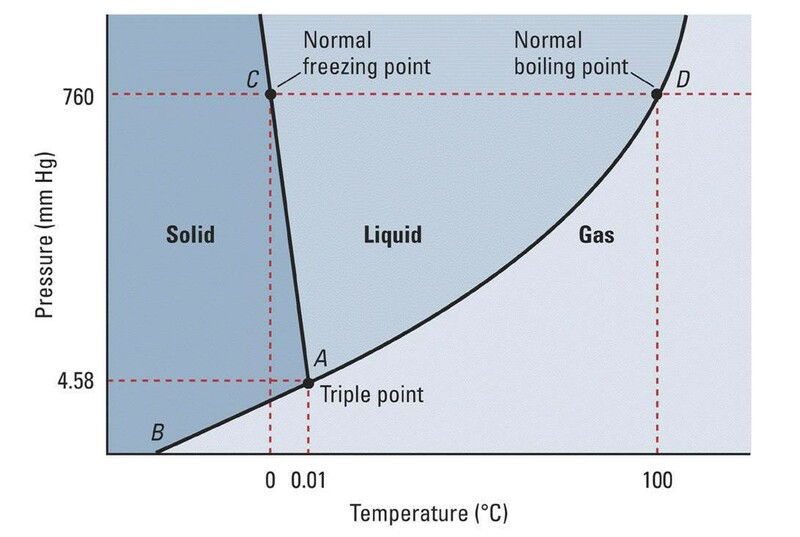 The figure below is a phase diagram of water. Here the parameter space is defined by all the possible combinations of temperature and pressure for a fixed volume of H2O. The phase transitions are the lines that separate the liquid water, ice, and water vapor. Phase transitions have typically been identified through experiment, rather than predicted theoretically. This is in part due to the very nature of phase transitions; they occur in principle because the properties of a particular system are not analytic at the transition. Analyticity is a subtle mathematical concept but the key implication is that it is impossible to extrapolate the known dynamics across the transition to make predictions about the other phase. So for the most part, the entire study of phase transitions is phenomological in nature. Phases are really just areas of a large parameter space where emergent (not fundamental) laws are consistent, and uniform. They are a way for scientists to organize our knowledge based on the relevant dynamics for particular parameters. They allow us to divide up a single system into many distinct classes of dynamics. We all probably have an intuitive idea of what life is. It is usually fairly obvious to us what types of things can be alive, and which types of things can never be alive (perhaps with a few exceptions such as viruses). Unfortunately translating these notions into a single definition is extremely difficult. Despite our intuition about what life is and what life is not, there does not seem to be much of a consensus among scientists. Many researchers choose to ignore the question, opting for a “I know it when I see it,” approach. This can be successful for biologists or biochemists whom, are typically interested in elucidating the mechanisms that life uses to function. However the problem cannot be avoided if we want to understand the origin of life. We cannot say when or how something started if we cannot define the very process that is starting. We don’t have a complete definition of life, but it is not for lack of trying. In fact, there are many working definitions out there. They vary from discipline to discipline and from person to person, and they are usually tailored with a particular purpose in mind. NASA’s working definition of life is an excellent example of this. NASA’s definition is: “a self-sustaining chemical system capable of Darwinian evolution.” This single sentence seems to encapsulate a lot of the key characteristics that we associate with life as we know it. However, this definition represents a fundamental problem which many astrobiologists struggle with. This problem is best explained with an example: Robert Forward has an excellent science fiction book in which ‘life’ begins on the surface of a neutron star. In the novel, this process has all of the characteristics we associate with life as we know it except that it is not chemical! All the metabolic and genetic processes are built on nuclear interactions rather than chemical ones. Clearly this might be a bit of a stretch, but it illustrates a point which is usually over looked: we often think of life as something that exists in parallel with its physical embodiment. Scientists and philosophers who study emergence call this functional equivalence. When new emergent phenomena are observed on a particular macroscopic scale, they are typically independent of the lower level microscopic details. The microscopic system can be completely different and still lead to the same macroscopic phenomena. We like to imagine that chemical systems are just one class of dynamical systems in which life could be instantiated, and that there are potentially many others out there, yet to be discovered. This is very similar to the idea of artificial intelligence, the notion that we could create a computer which would experience subjective reality in the same way our organic brains do. Life uses physical processes, and therefore is ultimately constrained by its physical embodiment, but the property of being alive is a higher level description of matter. Single molecules are not alive, and yet all living things we know of are made of molecules. What this suggests, is that life is an emergent property of matter. We also suspect that life is not a property that is found in EVERY physical system. If we take life as we know it as an example, it is clear that there are certain conditions under which matter can be alive, and certain conditions where it cannot be alive. Life is everywhere on earth, but hasn’t been found on the moon for example. Its possible non-chemical life could exist in places where chemical life couldn’t (like on the surface of a neutron star, if we take Forward’s example). Any particular type of life will presumably have a particular range of environments where it can exist. So now for a given physical system, we can imagine a very large parameter space, similar to the one above for water, except that it may have many more dimensions than just 2. We can divide this space into regions where the system could be alive, and regions where the system could never be alive. So we have regions of a parameter space which we can identify based on their emergent properties, namely we can separate regions of this space based on whether or not the system is alive in that area. We’ve just defined a phase. But what should characterize the living state? What kind of phase diagram would such a thing be placed on? Could we ever define the boundaries? Does this actually get us anything new? Or are we still stuck with all the problems of defining life? Researchers have been using the notion of the living state as a unifying theme to improve our understanding the origin of life and the biosphere as a whole. The prominent mathematical biologist Martin Nowak has demonstrated that tuning another parameter can drive a system from what he calls ‘pre-life’ to a different phase which he calls ‘life’ (based on the possibility of replication and evolution in that phase). The Nobel laureate chemist Manfred Eigen has hypothesized that the on-set of natural selection is a phase transition. Physicist Eric Smith has suggested that many of the metabolisms we find here on earth represents an undiscovered class of non-equilibrium state, the onset of which, would have a lot in common with other phase transitions. So it is possible then that life is a state of matter. What are the characteristics of this state? What parameter space will most clearly demonstrate the existence of this state? We don’t know the answers to these kinds of questions yet but this idea gives scientists a framework to begin working with. In particular it provides an excellent theoretical framework to begin understanding the origin of life as a phase transition. By creating and characterizing this theoretical phase space, researchers can begin to separate out specific and tractable questions to address the origin of life on earth and elsewhere. Further, this framework allows researchers to make progress on the origin of life without ever having to define it explicitly. As new definitions are proposed they can be placed inside this phase diagram, allowing us to understand how those definitions are related to each other. Life as a state of matter represents a novel and promising framework to understand biology and its origin. Previous Who’s Paying for Peer Review?